Click here for a short story I recently had published in Honeysuckle Magazine. (It begins on page 5; but check out all the good stuff inside.) 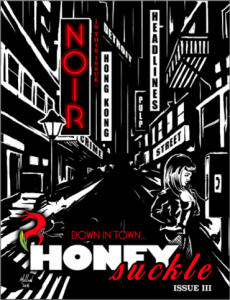 The story’s original title was Wisconsonian Glaciation and Its Role In the Formation of Long Island but I edited the glacier out of the tale (although the glacier wasn’t happy about this) and renamed it, rather more economically, Summer Noir for Honeysuckle’s Issue 3: Noir.